Are Warren Buffett and Jimmy Buffett Related? I couldn’t agree more ;) It was left by a Ted Jenkin over at oXYGen Financial, who then went on to say that Buffett #1 (Warren) likes to buy and keep stocks forever, whereas Buffett #2 (Jimmy) prefers to have someone else manage ’em for him through the wild mood swings as it’s “always 5 0’clock somewhere.” And indeed it is. My first search into this DNA mystery led me to this article done by Fortune in 1999, and then reposted on CNN MONEY. It finds that Warren Buffett’s sister, Doris – a genealogist – had mailed out 125 questionnaires to all the Buffetts living in the U.S. trying to get to the bottom of it, and while she gets close, there was nothing really solid to link the two of them together. After that article, I found another – also by Fortune – written 8 years later :) Which involved Google co-founder Sergey Brin’s wife and her startup, 23andMe, which decodes DNA to help people understand their ancestry more (the name comes from our 23 paired chromosomes). And who was also apparently intrigued by the possibility of them being related! So as awesome as it would have been if they were related, sadly Mr. Jimmy and Mr. Warren are not. Nor do they have some superior bloodline that can beat out 99.9999999% of mankind ;) What they are, however, are great role models to us. And one day I can only hope to run into them over a scrumptious cheeseburger in paradise! I don’t wanna be that guy…but shouldn’t it be “Are”? In any case, they should have a man-baby. It would rule the world. No problemo, love the blog, easiest way to pay ya back! Jimmy Buffet, Warren Buffett or the guy who owns the local Mandarin Buffet. I would love to be remembered in the wills of any of them. That was quite the random post, J. 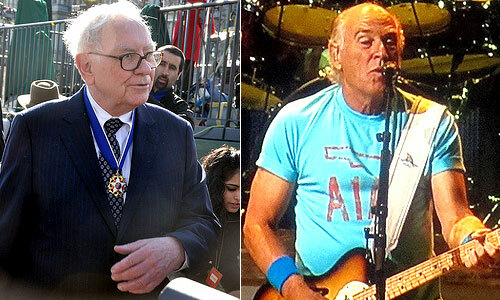 And yes, Buffet looking very much like Larry David right now. Hilarious! Interesting the difference, though: Warren keeps his fortune, but Jimmy is easy come easy go with them. Amazing talent for building a merchandising business off his music, Jimmy. Yes, he does indeed look quite a bit like Larry David after a quick glance. Warren always likes to joke that he and Jimmy are “distant” cousins but, like you said, they really are not. I could be wrong, but I believe that Warren is an investor in Jimmy’s restaurant chain though. Another reason to be like Jimmy… he gets a piece of everything from his concerts, including alcohol sales. Most artists are lucky to get anything outside of their t-shirts sales. His ability to brand himself is amazing… who would have thought a song about a “frozen concoction” would turn into an apparel/casino/restaurant/lifestyle empire! WHAT??? REALLY??? I want to be you!!!!! A cheeseburger hey? Interesting choice, i’m not sure Mr W.Buffett would be eating cheeseburgers with the amount of money he is making. How funny that Jimmy Buffet is such a hot topic lately! Just the other day I was reading about how he is a gazillionaire from his restaurants and food lines. I had no idea! HAH!!! That would be something, wouldn’t it? I know nothing about either … makes me feel young. Go back far enough, and we are all related, right? It’s funny that when two people have the same uncommon last name, you always assume they are related even though it can be just a coincidence. There is a Sir Edward Antrobus out there in South Africa, but aside from the name, the only thing we have in common is ancestry from the village of Antrobus in England. One makes money making music, the other just makes money. I would think that’s about all they have in common. I think if you go back 10,000 years you’ll find we’re all related to each other in some minor way! Hmmm… something I never wondered about! J this is so flipping random and I love it! Not something I’d ever even thought about, let alone thought I read about…I am definitely down with the cheeseburger (make mine garlic fries, thanks!) though; wouldn’t that be a cool chat? My personal belief? Mr Buffet, of the frozen concoction, ought to be named a saint! He may not have invented it, but he sure brought fame to the drink favored by so many. I know you’ve given it up for Lent, but your days are flying by and that yummy margarita might be the way to celebrate your days of sacrifice. On the other hand, being a beer snob myself, I’d stick with the beer. Whatever you choose, cheers to you!!! I like that idea! Margaritaville here I come once Easter hits! Woo! Interesting post, never even considered it but they share many similarities, most of all the uncanny ability to build wealth beyond belief! Thanks for the post!! When I received my DNA testing results from 23andMe it turns out I am related as a distant cousin to both Jimmy on my mom’s side and to Warren on my dad’s side. Should I appear in a article with them as the genetic link between two unrelated Buffetts? No – I’m not being sarcastic. I was quite surprised when I received my results.. Also I found that I am related to Leo Tolstoy from my dad’s side. I have 3 stars appearing on my 23andme.com profile from Jimmy, Warren, and Leo. You have my email address if you would like to contact me. Previous post: Don’t Tax Me, Bro!